The last stops had brought some real ups (trekking in the Andes, sandboarding in Huacachina) and downs (the Islas Ballestas). 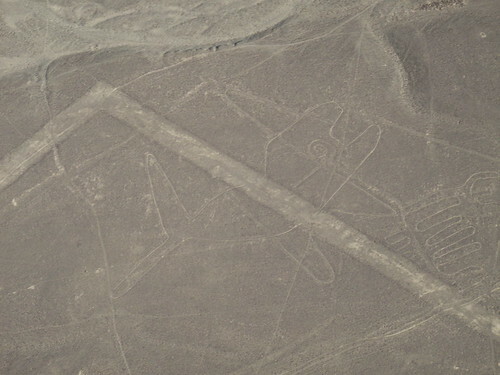 Arriving in Nazca it seemed to me that the Nazca Lines could easily go either way, and I was in two minds as to whether to bother with flying over them or not. Eventually, I realised that while Huacachina and the Ballestas are hardly world famous, whereas I’ve known about Nazca since I was a kid. 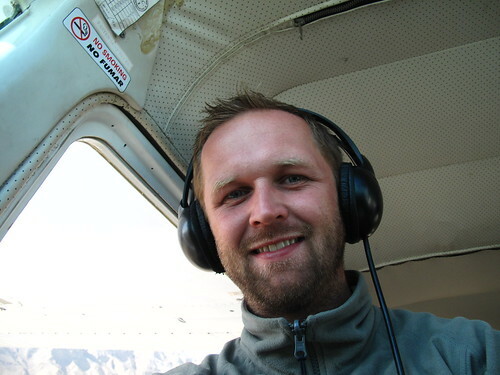 So I decided to give the flight a go, hoping the reason for that fame lay in more than just their mysterious origins. The flight itself cost $50, which I suppose is quite cheap for a flight, but still a little pricey for a forty minute experience. The plane itself was tiny, with seats for just five passengers, and I got to sit right in the front, next to the pilot, which was pretty exciting in itself. We were soon airborne, and within minutes were over the giant rocky plain that is home to the lines. 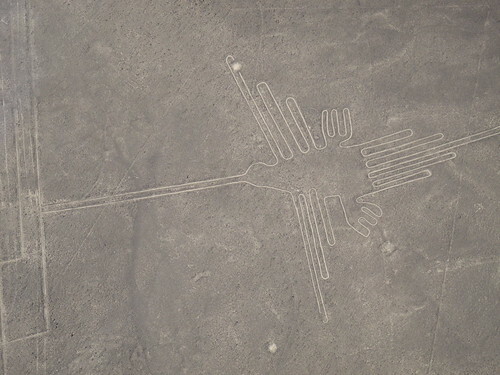 Despite a lifetime of work by the archaeologist Maria Reiche, no one is quite certain why the lines are there, with various theories being espoused including suggestions that they pointed to water sources or were fertility symbols, or even left by extra terrestrials. Whatever the truth, the fascinating thing is that they can only be seen from the air, so flying over at around 200m is the only way to see them. Ultimately, they are just giant stick symbols. I wasn’t expecting to see them all that clearly, but as soon as we were above them they stood out way better than I was expecting, especially the hummingbird. My personal favourite was the monkey (probably because it reminded me straight away of someone I know), but they are all pretty cool. Getting off the plane, I realised I was really impressed and I really couldn’t work out why. It’s not that they are ancient and mysterious – I just can’t manage to get very excited about all that for some reason. I think it’s partly because it was fun being up in such a tiny plane, partly because I was expecting so little, and partly just because it’s cool seeing giant animals drawn on the ground in such a way you have to fly above them to see properly. Whatever the reason, it was bafflingly good fun. It very nearly turned out to be a bargain, too. When I went to pay the night before, I only had two 100 sol notes on me, and it cost 150. As per usual for Peru, they had no change, so I just paid 100 with a promise that the person collecting me would ask for the other 50 in the morning. What with it being an early start, I forgot entirely and no-one asked me for it. I didn’t realise until later when I was sitting in a restaurant and it suddenly hit me. At which point I was hit with a moral dilemma. Should I ‘fess up and pay? Or should I hide out for the rest of the day and hope I’d get away with it? One the one hand, immoral Geoff was thinking what the hell, I know for a fact I’ve been overcharged for things recently (after comparing prices with other travellers), in one case by a fair bit more than 50 soles, so I’m due a bit of payback, and anyway, they’d probably never find me. On the other hand, moral Geoff was thinking, they have costs to pay, tourism is down this year because of the crisis, it would be wrong to try and defraud them when I can easily afford it. Plus I’d had a very lucky escape earlier (jumping out of the taxi back from the airport my wallet had fallen on the pavement without me noticing, and I was lucky enough for it still to be there when I realised quarter of an hour later when I went back – I was in a real panic for a moment, as it had my only card in it), and if the locals were honest enough to not to steal from me, who was I to steal from them? Luckily, my moral dilemma solved itself pretty damn quickly without me having to make a decision. Nazca’s a small town, and there are only so many cafes a tourist can hang out while they wile away the hours between the early morning flights and the late evening night buses. As I sat there pondering what to do, the travel agent turned up in the restaurant. Seeing her before she saw me, I realised the game was up and had the 50 soles in hand before she even got to the table. 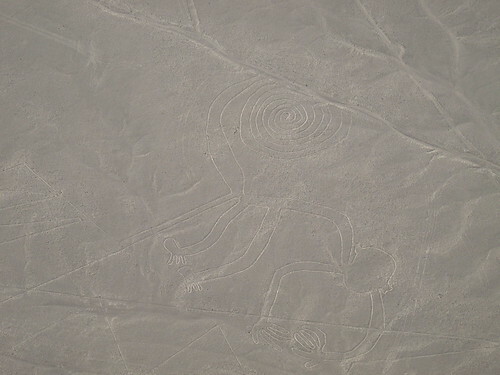 You can see the rest of the Nazca Lines photos here.